OriginalFake and Medicom Toy get the Halloween spirit with their latest collaborative offering, a ‘KAWS CERAMIC SNOOPY’. The ceramic snoopy is a small bowl with removable top in the shape of a pumpkin with Snoopy serving as the handle for the top. 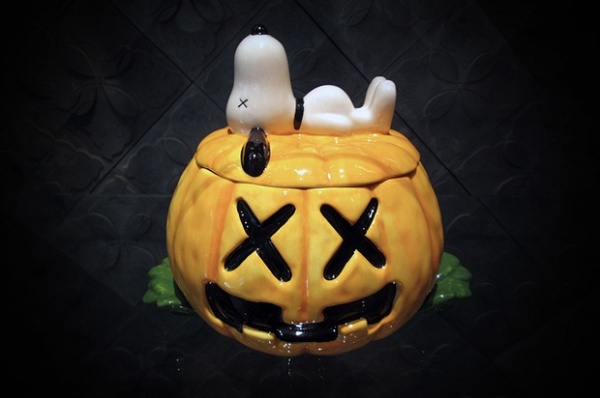 Featuring KAWSâ€˜ signature styling on the pumpkin face and Snoopy, this piece is arriving just in time for all hallow’s eve. You can get an early start on the Halloween proceedings now via select OriginalFake stockists.